We would like to thank all the volunteers for braving the storm to participate in the recognition evening on Tuesday, January 29th, 2019. Thanks to your sustained efforts throughout the campaign, we presented a cheque of $25 000 to our Maître d’Oeuvre, Centre d’Action Bénévole L’Actuel. Congratulations to all! In addition, we would like to congratulate all the winners of the evening who received a gift certificate worth $25.00 from the various food collaborators who supported Operation Red Nose Vaudreuil-Dorion during the 2018 campaign. Also, we had two winners during that recognition evening, Vanessa Leduc who was the lucky winner of the SAAQ Safety Kit and Hanae Ragout was the lucky winner of the Château Vaudreuil Night gift certificate. BRAVO for your involvement and a big THANK YOU to all of you and look forward to seeing you again during the 2019 campaign. 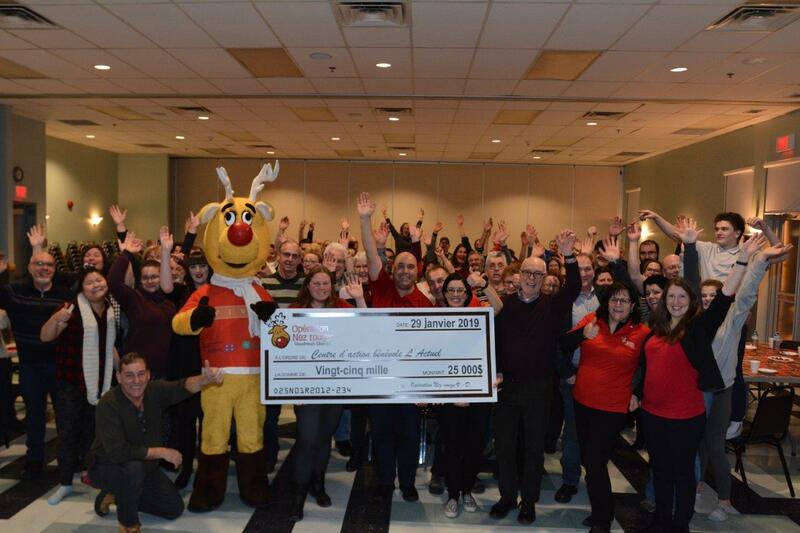 If you are organizing a public or a private event and you wish to have our mascot present, Vaudreuil-Dorion’ Operation Red Nose will be pleased to attend your event. Vaudreuil-Dorion’ Operation Red Nose is constantly looking for volunteers for its different activities whether it is about designated driver service or awareness on road safety.